It all started with five dollars. Five dollars, a compelling need for legal help in the community, and a Rabbi with a license to practice law. Rabbi Stanley Levy became aware of a pressing need for legal assistance from Holocaust survivors and other Los Angeles seniors. Illegally evicted, defrauded into debt, denied access to deserved government benefits are just a few of the issues faced by impoverished elderly residents of Los Angeles. He knew he could help them but he couldn’t do it by himself. He called upon his long-time friend, Luis Lainer, who held a similar passion for assisting those in need. Together, they assembled a group of 18 friends – attorneys, social workers, law students and legal secretaries – each who decided to say, “Here I am to help.” Every person pledged five dollars a month to rent a storefront office on Fairfax Avenue, and to give one night a week to improve the lives of the low-income and disadvantaged. 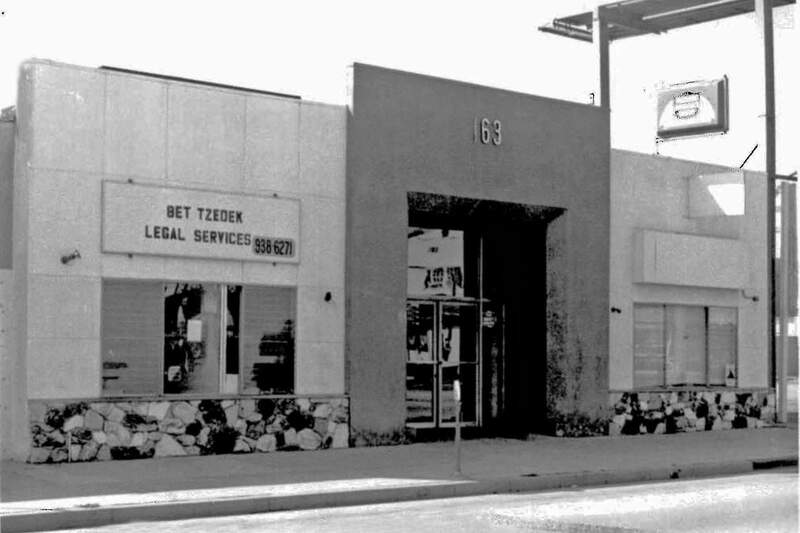 Now, over 40 years later, Bet Tzedek Legal Services is recognized as one of the premier legal service agencies in the country. Our staff is privileged to assist more than 20,000 individuals a year with legal problems such as caregiver issues, consumer fraud, employee rights, foreclosure matters and much more. Our impact stretches beyond the courtroom. For the hundreds of thousands of clients we have represented throughout the years, it’s more than a case…it’s a chance to change lives. Bet Tzedek, in collaboration with the LA City Attorney’s office and other local organizations, successfully secured over $1M in restitution for approximately 60 car wash employees who were victims of alleged wage theft. The award is believed to be the largest ever paid in restitution to car wash workers here in Los Angeles. Our Employment Rights Program has obtained nearly $40M in judgements and settlements for workers since its inception in 2001. Bet Tzedek, with Irell & Manella LLP and Public Counsel, filed twin class actions lawsuits on behalf of thousands of LA County homeowners alleging financial elder abuse by two companies which with the county to operate the Property Assessed Clean Energy (PACE) program, which finances “green” home improvements. The lawsuit alleges the program leaves thousands of low-income, elderly, and non-English fluent residents exposed to predatory lending practices. The LA LGBT Bar Association honored Bet Tzedek with its Community Service Award for our trailblazing work to promote trans-equality through our Transgender Rights Project, which has helped over 800 individuals since its inception in 2016. The Judicial Council of California honored Bet Tzedek with its Distinguished Service Award recognizing our 40 years of service providing free legal services, with special recognition for our Family Preparedness Project serving undocumented parents. The LA County Board of Supervisors publicly commended Bet Tzedek for its leadership in combating elder abuse. This followed Bet Tzedek’s hosting of a statewide symposium on the financial elder abuse attended by over 200 service providers. Bet Tzedek’s Low-Income Tax Clinic crosses the million dollar milestone upon winning a total of $1.1 million in refunds and savings for its clients since its founding in 2014. Bet Tzedek now provides assistance to approximately 70% of all conservatorship filings in Los Angeles County. Bet Tzedek and its pro bono partners settle the largest employment class action lawsuit in the Inland Empire history, recouping $20 million in stolen wages for low-wage workers. Our work to protect low-income tenant, garment workers and people living with HIV received three State Bar of California President’s Awards. Bet Tzedek and its Kindship Care Program successfully co-sponsor AB 900 which will help children stay in safe, supportive homes with legal guardians. Bet Tzedek’s Board of Directors appoints Jessie Kornberg President & CEO, the first woman to hold the position in the agency’s history. Recognized as a rising star in the field of law, Korberg brings her commitment to social justice, litigation and pro bono service to bear on the agency’s path forward. Through its Kinship Care Program, Bet Tzedek educates lawmakers about the need for uniform application of probate laws, particularly as they relate to unaccompanied minors. This leads to the passage of SD 873 and Bet Tzedek’s first-of-its kind victory in the appellate court which preserved the right for immigrant minors to be treated equitably in guardianship proceedings. As a recognized leader in serving the needs of Holocaust survivors living in the United States, Bet Tzedek testifies before Congress about the harmful, and often tragic, effects on frail survivors when their reparations payments were wrongfully counted against them in determining eligibility for public benefits. This leads to a rewrite of the Social Security Administration’s procedural manual, providing strict guidance to eligibility workers and preserving benefits for countless survivors. Bet Tzedek leads a five-agency collaborative – the California Consumer Justice Coalition – to help Southern Californians caught in the state’s foreclosure crisis. With the funding from the State Attorney General’s National Mortgage Settlement Funds, the coalition’s attorneys and housing counselors walk consumers through their rights and responsibilities. To address the myriad of legal issues associated with the crisis, the coalition launches a user-friendly consumer-focused website. In partnership with the Superior Court of Los Angeles, Bet Tzedek’s Self-Help Conservatorship Clinic helps families and caregivers navigate the complexities of the probate court’s conservatorship requirement. Nearly 1,500 litigants, who would have had to complete over 70 pages of legal paperwork on their own, received free guidance from Bet Tzedek staff and pro bono partners. As of this year, Bet Tzedek’s assistance reaches nearly 45% of all conservatorships filed in Los Angeles. 400 carwash workers represented by Bet Tzedek’s Employment Rights Project win the largest monetary settlement, $1 million, to date in a landmark class action lawsuit with a carwash employer in California. Bet Tzedek’s four courthouse-based Self-Help Conservatorship Clinics assist 1,200 self-represented litigants, a three-fold increase in just three years. Bet Tzedek partners with Saint Francis Medical Center, part of the Daughters of Charity Health System, to form a medical-legal partnership in which attorneys and medical staff work together to alleviate the social determinants that cause or worsen 60% of health conditions. The Holocaust Survivors Justice Network receives both the National Law Journal’s Pro Bono Award and the American Bar Association’s Pro Bono Publica Award. Bet Tzedek’s Employment Rights Project wins the first civil jury verdict in a human trafficking case litigated under the California Trafficking Victims Protection Act. The jury awarded $768,000 to the plaintiff, including $500,000 in punitive damages, claiming a spot in the Los Angeles Daily Journal’s list of top 10 “High Impact” verdicts in California. The Employment Rights Project successfully advocats for the extension of California’s Car Wash Worker Law, AB 236, aimed at preventing exploitation of workers. Bet Tzedek creates and implements its innovative Pro Bono Clinic Model which serves as the foundation for its national Holocaust Survivors Justice Network. One staff attorney coordinates a project-dedicated team of volunteer advocates from LA’s pre-eminent law firms who are recruited for their expertise and commitment to long-term involvement. In the first six months, the model increased the number of clients served by more than 500%. By the end of the year, nearly 4,000 volunteers provided $8 million in pro bono support. In partnership with the Los Angeles Superior Court, Bet Tzedek launches the Self-Help Conservatorship Clinic and assists more than 400 self-represented litigants file for a conservatorship for a loved one. Bet Tzedek joins the city of LA in opposing the so-called “Landlord’s Solution. “ The Superior Court agrees and upholds a law prohibiting landlords from evicting tenants who fail to comply with intrusive requests for information, designed to break their tenancy. Bet Tzedek settles a case on behalf of garment workers employed by a contractor to a national retailer. Because of a new state law, the award is the first time ever that a retailer agrees to pay workers for a manufacturer’s labor violations. Bet Tzedek played an important role in the passage of the law. For the first time, Bet Tzedek litigates internationally when representing victims of Nazi persecution in the German court system as Holocaust survivors appeal denials of restitution payments. In California, State Treasurer Phil Angelides joins with Bet Tzedek and convinces U.S. banks to waive wire transfer fees on payment to indigent survivors. Bet Tzedek settles a major lawsuit against the city’s most convicted slumlord after unraveling a complex web of sham corporations and other fraudulent practices. The settlement wins $1 million for the city and ongoing monitory of his business practices by Bet Tzedek. Bet Tzedek opens the Employment Rights Project in recognition of the growing numbers of “working poor” in LA who remain low-income despite working full-time as garment workers, day laborers, domestics, carwash employees and gardeners. Bet Tzedek establishes the Kinship Care Project to assist relative caregivers who are custodians, legal guardians or adoptive parents to minor children. Bet Tedek helps secure health care, education and assists in formalizing the custodial relationships. Bet Tzedek and pro bono counsel prevail in an eight-week trial to win back the rights to her life story for Irene Gut Opdyke, who is a “righteous gentile” that saved the lives of dozens of Jews during World War II. Bet Tzedek represents more than 100 tenants of an abandoned downtown building using a series of local statues to clear title and remove millions of dollars in liens. Bet Tzedek clears the way for a new owner to acquire and rehab the building. Bet Tzedek brings a major class action suit as pro bono counsel against 16 European-based insurance companies who refused to honor insurance policies purchase by those who perished in the Holocaust. Three Bet Tzedek staff and Board members serve on the Mayor’s Blue Ribbon Committee on Slum Housing whose recommendations are passed by the LA City Council as the most comprehensive code program in local history. California law enforcement, the Federal Trade Commission and the United States Justice Department use two training videos produced by Bet Tzedek for prevention of home equity fraud. A Bet Tzedek investigation reveals widespread violations of both state and federal law in LA-area nursing homes. As a result, Bet Tzedek sponsors legislation to establish a standardized admission contract that becomes a state law. Following the Northridge quake, Bet Tzedek establishes an Earthquake Services Unit and assists more than 3,000 earthquake victims with housing issues, home improvement fraud and FEMA claims. Bet Tzedek expands it Housing Conditions Project to aggressively advocate, through litigation and public policy advocacy, for low-income families living in slum conditions. With a grant from the federal Health Resources Services Agency, Bet Tzedek joins the Alzheimer’s Association in establishing the El Portal Project; a consortium dedicated to serving Spanish-speaking families who care for a family member with Alzheimer’s disease. LA Mayor Tom Bradley commends Bet Tzedek for providing services during and after civil unrest. Advocates continue to see clients at senior centers in the central city during the riots. Bet Tzedek sues a national HMO alleging fraud and deceptive sales practices in its solicitation of elder Spanish-speaking enrollees. Ensuing media coverage prompts a federal investigation and a stockholder suit against the company. Bet Tzedek successfully settles the underlying case. Bet Tzedek forms a Home Equity Task Force to address a rising epidemic of con artists stealing homes of elderly owners. After four years of litigation, Bet Tzedek negotiates a settlement that guarantees elderly, long-time residents the right to remain in a refurbished Cadillac Hotel on the Venice boardwalk for the rest of their lives at their current low rent and without fear of further threats of eviction. Bet Tzedek wins a landmark decision that helps thousands of needy Holocaust survivors in the U.S. Court of Appeals when the 9th Circuit rules in favor of Bet Tzedek’s client and childhood survivor, Felicia Grunfeder, who was denied disability benefits because she received a small reparations payment. After multiple appeals, the federal courts rule that reparations payments cannot preclude disability payments. With a grant from the City of Los Angeles Department of Aging, Bet Tzedek launches the City LAWS Program to send attorneys to senior centers to help with their legal needs. Word-of-mouth brings a diverse clientele to seek Bet Tzedek’s assistance. The agency grows to serve 1,000 clients annually. Bet Tzedek received a seed grant of $23,000 from the Jewish Federation of Greater Los Angeles and expands it services. Flyers on telephone poles in the Fairfax district announce a new free legal service program run by volunteers.